Thank-you letters are always appreciated by the people who give you references, write letters of recommendation on your behalf, or provide a recommendation on the professional networking platform LinkedIn for you. When you take the time to say “thank you,” your reference providers will be even more inclined to recommend you next time around. Everyone likes to feel appreciated, particularly when they’ve taken extra time from their work day or after hours to provide a written recommendation for you. In addition, if you get a LinkedIn recommendation from them, consider following suit and, if you can recommend the person, do so. They will appreciate this, as well. How should you relay your thanks? 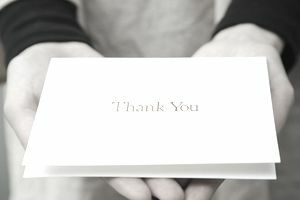 You can say “thank you” via email, via a thank-you note card, or by writing a traditional letter. Any of these is an acceptable way to convey your gratitude. The advantage to sending a handwritten thank-you note or a letter is that the person has a tangible reminder of your appreciation. That makes more of an impact than an email message which can be quickly filed away or forgotten. When you are not sure what to include in your reference thank-you letters, it's always a good idea to review samples. You'll be able to get ideas and suggestions for your own email messages, notes, and letters, which you can then use to personalize your correspondence to fit the circumstances. Here are a variety of thank-you letter samples for references and recommendations. Here you can review a sample email message saying “thank you” for a reference which at the same time informs the reference writer that the person was hired. People are innately curious, and it provides both closure and an opportunity for celebration when you take the time to let them know that their efforts have yielded happy results. Here’s an example of a reference letter saying “thank you” for a reference for employment. This letter also updates the reference provider on the status of the candidate's job application. Letting people know that your job search is still in progress alerts them that you are still free to consider rising new job opportunities they may know about. This sort of networking is a great way to “seed” and develop your list of possible target jobs. Has someone agreed to provide a recommendation for you as part of your college application? Have a look at this example of a reference letter saying “thank you” for a recommendation for college. For those instances when you lack either the stationery or the time it takes to pen a handwritten note of thanks, it’s fine to send an email thank-you letter instead. In addition to saying “thank you” in your email, make sure to include your contact information (email address and phone number) so that you and the recipient can keep in touch. References are more important to a job search than you might realize. Find out who you should ask for a reference or a recommendation, and how to best ask for their help, by reading through “References and Recommendations.” For more inspiration and tips about how to structure various types of recommendation letters, you’ll find several reference letters, personal references, academic reference, letters asking for a reference, and lists of references at “Sample Reference Letters / Recommendation Letters." Finally, before you even begin to apply for jobs, you should plan ahead and compile a list of references and some letters of recommendation, so you're prepared to provide these immediately when a prospective employer requests them. If you are an established professional, good people to add to your list of references include supervisors, work associates, and / or people you know personally who already work for the company you are targeting. On the other hand, if you’re an entry-level job candidate with limited experience, it’s fine to approach teachers, coaches, pastors, or people you know through volunteer work about the possibility of their serving as a reference for you. Here's how to ask for a reference.